Interactive capacity development workshops are offered to educators and education officials. The workshops are based on the following themes: Biodiversity, Sustainable Development, Climate Change, Biodiversity Careers and the Active Learning Framework. 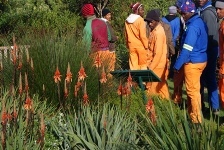 The programme facilitated Biodiversity Education training for EPWP workers at Harold Porter National Botanical Garden. These workers are responsible for rehabilitating areas when building projects are completed. The training sought to build the worker’s capacity and knowledge about the environment. The training demonstrated the link between humans, plants and animals; showing that plants and animals provide us with ecological services such as beautiful scenery, oxygen, possible future medicines, etc. This lesson showed them why the work they do is important and why it is essential to preserve our biodiversity.